When and how did you first become involved with an undergraduate research project? I did not consider research until I joined the Advanced Honors College, which has a thesis requirement. Also, I added a chemistry major at the end of my junior year. When I joined the department, I was assigned an academic advisor with whom I spoke about research in general with. At first, I intended on looking for an advisor in the medical field or working in a medial-related field. However, my academic advisor was so enthusiastic about his work, that even though I understood almost nothing about his work, it seemed interesting and I figured I would learn something different. My academic advisor turned out to be my research advisor as well! Describe your undergraduate research project. Mechanistic studies of non-heme metal complexes. This project involves the synthesis of ligands to make metal complexes using transitions metals such as Iron and Zinc and then going on to derive mechanistic details through kinetic studies. In addition to this: Photochemistry Outreach Program with High School students. The goal of this project is to allow high school students the opportunity to participate in hands on lab laboratory research in order to encourage students to pursue STEM in college. Explain how you obtained a CURCA $500 Undergraduate Research Award and what it was used for. How was the award beneficial to your academic experience at UB? Last year I was awarded the CURCA grant and the Honors College Research & Creative Activities grant. It was the first grant I ever wrote so it was tough at first and as a science major, I don’t do a lot of writing in my courses. I visited the CURCA office twice to review my proposal before submissions, which I found to be very helpful especially with all of the technical details that must be perfected before submission. The grant helped fund all the chemicals, glassware, and instrument use that I needed for both my projects. Describe what it is like working in a lab. Working in a lab is actually relaxing and fun, but also tough at the same time, especially as an undergraduate student. Everyone helps each other out and everyone also learns from each other inside and outside the lab. I think the lab I am in is one lab where everyone gets along and everyone will celebrate each other’s birthdays, go out to an activity, or just hang out together. On the other hand, due to the nature of chemistry research, it is very time consuming and if one step goes wrong you cannot always undo the mistake. Also as someone who did not have much lab experience coming in, I didn’t know how to perform many techniques or use a certain instrument and constantly asked graduate students in the lab for guidance. How has your faculty mentor influenced you? My faculty mentor has positively influenced my confidence, thought process in chemistry, time management skills, and writing skills. In the lab, there is rarely 100% yield or perfect results so you usually learn by doing. Currently, one of my lab mates has an elaborate setup of strings and a ruler that he figured out works best to run a kinetics experiment. My faculty mentor trains every student before he/she starts in the lab and is always willing to answer any questions, help out with a technique, or just discuss any topic of interest to you. Stop by the Celebration of Student Academic Excellence in UB’s Center for the Arts on April 26th to learn more about Bao’s research! When an d how did you first become involved with an undergraduate research project? I got involved in my first lab by emailing a neurology professor who posted a project on the CURCA website to recruit students. My advice on taking this route is be patient and keep trying as it will take quite a few attempts. For my second lab, a graduate student in the chemical-biological engineering department needed help with his research and emailed the undergrads’ listserv. So I responded to that email to apply for the position and I got to work with him on his research. Describe your undergraduate research position. I have two projects I am working on. The first one is developing and optimizing radio-frequency coils for magnetic resonance imaging. This project generally involves 3D printing, circuit building, basic programming, and mechanical-electrical engineering related work for optimizing the coils. The second project is largely related to the field of molecular/cellular biology. The big picture of the research project is to study a specific protein with regards to its effect on stem cells differentiation potential. However, my specific duties are assisting with immunostaining, microscopy, histology, image quantification and analysis. I obtained the $500 research grant from CURCA for my radio-frequency coil building project. I followed the instructions on CURCA website and gathered the documents needed for application with the help of my research adviser. The application process was straight forward and simple. The grant was used for purchasing materials and instruments needed for the project. Clearly, the grant was helpful to maintain and elaborate my project, which made up a big part of the practical training component in my academic experience at UB. I have different experiences with different labs. However, there are feelings I have in common: amazed by the new things learned, motivated to learn more, and an adrenaline rush when results are achieved. Working in a lab involves a lot of learning, which could be intimidating on top of being a full time student. Also, the tasks assigned to an undergraduate student are most likely to be basic and repetitive, but this will change as one gained more skills. The lab crews are generally understanding and would be willing to guide undergraduates through their tasks. What is more significant is the opportunity to meet and interact with people who possess the projections of their related disciplines into the far future. It is mind-blowing to hear about some of the principle investigators’ visions on the future of their work. When working with a faculty mentor, they open my mind to new ways of thinking and give me new perspectives on a subject I would never think of. My mentors are major sources of inspiration on my career choices as well as life decisions. Have you had the opportunity to present your research project? If so, please describe that experience. Yes, I presented at UB’s Annual Celebration of Student Academic Excellence in 2017 (and will most likely present in 2018 as well). I was specifically interested to see what other undergraduates are working on at UB, and that was the ideal opportunity to do so. Personally it was also an opportunity to reinforce my knowledge on the project I presented, because I had to not only understand the material thoroughly but also be able to present it in such a way that everyone in any field would be able to understand. How has/will this opportunity benefit you academically and/or professionally? Being able to communicate my project to a broad audience was a much needed skill. This opportunity was good practice for me. Moreover, I got connected to a few other undergraduates who were also doing research at UB, which could be argued for learning networking skills, or just simply making more friends. Additional details about Jojo’s projects can be found here. I first became involved with undergraduate research through the UB Nanosat Lab (UBNL) when I was a freshman. There was a steep learning curve when I first started, but the chance to start building experience early on in my undergraduate experience was very beneficial. The undergraduate research project that I have been involved in is the UB Nanosat Lab (UBNL) listed on CURCA’s website as “Nanosatellite Design, Testing And Fabrication”. We are a multi-disciplinary lab that builds satellites for the Air Force and NASA. When I first started on the team I was a member of our Attitude Determination and Control subsystem and worked on projects such as our sun sensor system and reaction wheel testing. Later, I became the Program manager of our GLADOS satellite and played a role in developing our mission and helping to move our system level testing forward. UBNL is an opportunity to work alongside many different majors to build real spacecraft and build important engineering experience. The CURCA grant that I obtained was used to fund my trip to present research at the IAA Symposium on Small Satellites for Earth Observation in Berlin, Germany. At this conference I presented research on reaction wheel torque characterization that I had developed in UBNL. This CURCA grant allowed me to travel and present my research on an international stage. It was a huge asset to my professional development as I received useful feedback on my research and I made connections with professionals in government and industry. Working in a lab is a fantastic educational experience. Doing research alongside other intelligent and motivated individuals is a great chance to learn from their experiences. Additionally, it’s a satisfying feeling to apply what you learn in class to real applications. My work in my lab also helped me move my career forward by developing real skills and gaining experience that helped me obtain internships and job offers. The faculty mentor for UBNL is Dr. John Crassidis. He has been a perfect mentor and role model throughout my entire undergraduate career. His extensive experience meant that he always was able to contribute meaningful technical feedback to the work in our lab. Additionally, he also provided me with useful career advice gained through his time at NASA and academia. Lastly, he was always happy to support me through recommendation letters and references so that I could obtain new and exciting opportunities. I had the opportunity to present my research at both the Small Satellite Conference in Logan, Utah and the IAA Symposium on Small Satellites for Earth Observation in Berlin, Germany. Both of these experiences were great learning opportunities. I received feedback on my research that allowed me to push forward with my technical goals and also had the chance to develop my presentation and public speaking skills which will aid me in my career. Additionally, the chance to attend both of these conferences allowed me to learn more about the aerospace industry and network with professionals. I hope to present research at the 4S Symposium in Sorrento, Italy this May and continue to build experience and develop professionally. My undergraduate research has been the most valuable learning opportunity of my career. It has allowed me to develop as an engineer by applying what I learn in class to real problems. It also gave me the skills and experience to help build my career and obtain internship and job offers. Lastly, documenting and presenting my research at conferences has been an opportunity to further my professional development. I highly recommend getting involved in undergraduate research to help further your goals! As an undergraduate student at the University at Buffalo you have access to a free membership to the S.O.C.. The S.O.C. serves as a resource to help students with finding undergraduate research opportunities, internships, conferences, fellowships and scholarships. This is a great way to find hands-on learning experiences based off your interests! Students can join by creating a login here using your UB email account. Major discounts to attend CUR’s National Conference and CUR Dialogues, both of which include workshops and opportunities to network with peers and representatives of funding agencies. Free access to CUR hosted webinars. Access to information on funding opportunities, jobs, and other resources on the members’ only portion of CUR’s website, in the monthly CUR E-newsletter, and over CUR’s listserv. Eligibility to receive mentoring or pre-submission proposal reviews from colleagues in your discipline. The opportunity to develop and be recognized for leadership skills within the academic community by serving on CUR committees and on the General Council or participating in departmental consulting, speaking, and other leadership activities. For more information and to learn how to become a member, please visit the Council on Undergraduate Research page on the CURCA website. Kun Woo Cho is a UB undergraduate studying computer science and engineering. KC was recently recognized for her research on developing an app for early autism detection. Two UB undergraduates found themselves on a mission last week in Albany: to show SUNY leaders that their investment in student research is money well spent. 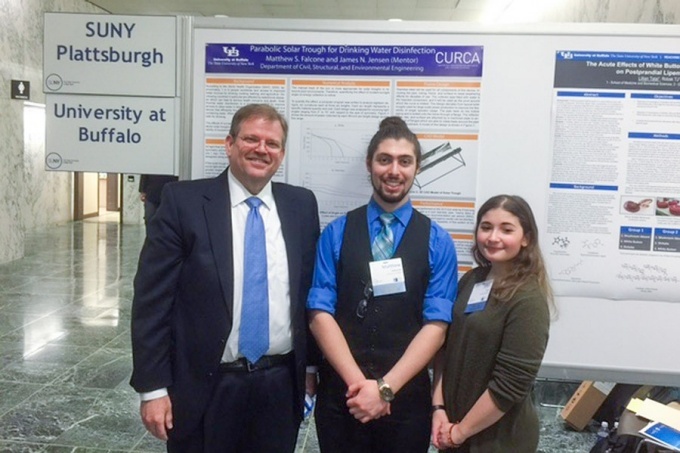 Matthew Falcone and Lily Talal presented their research to SUNY leaders at the biannual SUNY Undergraduate Student Research and Creative Activities Forum, held Feb. 24 at the Legislative Office Building. They were accompanied by Tim Tryjankowski, director of UB’s Center for Undergraduate Research & Creative Activities (CURCA). The forum celebrates undergraduate research by inviting two students from each of the SUNY campuses to present their work to members of the New York State Senate and Assembly, as well as representatives of Gov. Andrew Cuomo and SUNY administrators, including Chancellor Nancy Zimpher. Falcone, a sophomore double majoring in environmental and civil engineering, presented research titled “Design of Parabolic Solar Trough for Empowered Sustainable Water Treatment in Developing Countries.” The aim of the project was to develop the most efficient parabolic solar trough design that can disinfect water in developing countries and during emergency conditions. Falcone’s mentor on the project is James Jensen, professor of civil, structural and environmental engineering. “UB is at the forefront of examining and providing solutions to our basic need for clean water,” Tryjankowski says. Talal, a freshman studying biomedical sciences, presented her research, “The Acute Effect of Shiitake and White Button Mushrooms on Postprandial Lipemia and Lipid Peroxidation,” with her mentor Peter Horvath, associate professor of exercise and nutrition sciences. Their work focuses on developing a treatment strategy to reduce the risk of cardiometabolic diseases. They have been focusing on mushrooms and how the fungi could improve dyslipidemia — an abnormal amount of lipids in the blood — by being a dietary substitution for meat. Congrats to UB’S Lillian Talal and Matthew Falcone for being selected to present at the 2016 Undergraduate Research and Creative Works Poster Program in Albany, NY. Way to go researchers! Alexander Cartwright, Former UB Professor and now Provost and Executive Vice Chancellor of SUNY, stopped by to learn more about Matthew and Lillian’s outstanding work. Courtesy of Chris Komin |UB students Chris Komin, Jake Dixon and George Gombert are hoping to qualify for the “Red Bull Can You Make It?” challenge in which they would travel to Europe and use 24 cans of Red Bull as their only means of payment. When traveling to a foreign country, it’s common for travelers to exchange currency. Three UB students are purposefully not doing this. Rather than money, they’ll be using an energy drink to pay their way through Europe. Three UB students are attempting to make the cut of participating in the “Red Bull Can You Make It?” challenge, in which 165 student teams from more than 50 countries will travel across Europe for seven days with only Red Bull energy drinks as currency. The winning team will win a paid summer vacation in Europe. When dropped off at their first destination, all competitors will have their phones and wallets taken. In exchange, they will receive 24 cans of Red Bull, which they must budget and use in creative ways in order to make their way through seven checkpoints and ultimately to the final destination: Paris. Three UB students, Chris Komin and Jake Dixon, both junior media study majors, and George Gombert, a junior mechanical engineering major, have hopes of competing in this year’s challenge, which runs from April 12-19. Komin, Dixon and Gombert, who refer to themselves as “Queen City Can Make It,” must be in the top 18 of the eastern region of the United States to make it through to the next round of the competition. From there, four teams from each region – north, south, east and west – will be chosen by Red Bull judges to determine who goes to Europe. Each team must submit a one-minute video that creatively displays why they should be chosen for the challenge. The winning decisions will be based on “video creativity, charm and energy,” according to the challenge’s official website. All three students are a part of UB’s Outdoor Adventure Club (OAC). Komin and Dixon, both Buffalo natives, have been close friends since middle school, bonding through their mutual love of the outdoors and adventure. Earlier this year, they met Gombert through OAC, and the three of them immediately clicked. “This is the perfect competition for us. We all backpack, we all travel and we love adventure,” Dixon said. Komin, Dixon and Gombert said that their backgrounds in outdoor activities and media study would give them an upper hand in the competition. They said they have the knowledge, interest and drive to succeed at this unique competition because of their numerous trips with the OAC and their videography skills. Dixon said he frequently watches videos from previous years, which help to “really amp him up.” He said that, if chosen, the three of them would have an exciting experience and possibly even win the whole challenge. Unlike many competitions, the winner is not chosen by who reaches the final destination first, but rather by who had the best adventure throughout. Komin explained that each team’s adventure is based off a point system. “You are given a camera and when you’re there you share your story and what you’ve been trading for Red Bull. There are different point values for different items traded,” Komin said. Past participants have traded Red Bull for items such as tattoos or skydiving. In terms of points, Dixon said the more unique the better. Komin, Dixon and Gombert have taken to advertisements in order to receive as many votes as possible. Their video will be on a 24/7 loop on Time Warner Cable News until Feb. 25. They have also developed a Facebook page where every step on their journey is documented and followers are encouraged to spread the word. Fliers have been placed all over campus on bulletin boards and tables. The “Queen City Can Make It” website has been projected on the screens of many lecture halls. “The main thing now is to get the community’s support,” Gombert said. “UB is so big that it’s hard to get the word out to everyone, but we are trying hard. Kori Hughes is a news staff writer and can be reached at news@ubspectrum.com. Welcome to UB CURCA News.